You are here: microTOOL / Knowledge Base / What is a Use Case? Use Cases. Your System at a Glance. What is a use case, what is it used for and what benefits are offered by use case diagrams? 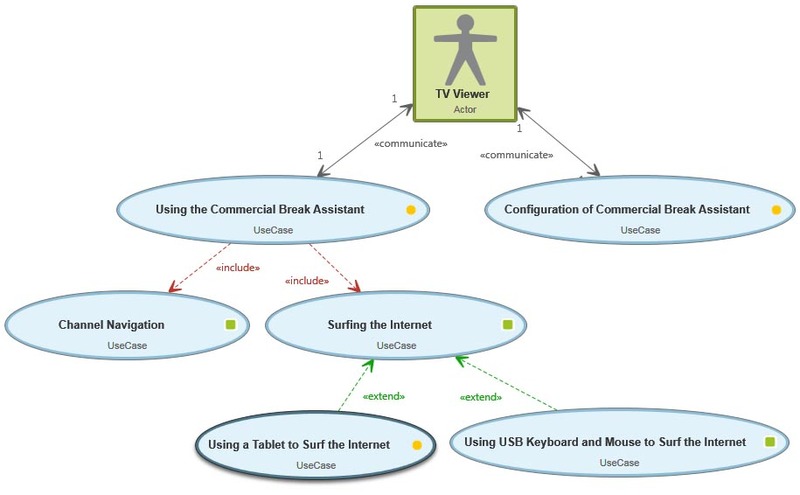 Use case diagrams show visible behavior of a system as well as the scenarios in which the system interacts with persons or neighboring systems. Actors are persons or systems outside of the system to be described, e.g. users, customers or processes. A use case is a scenario that describes the interaction of an actor with a system. It is also a description of what can happen during the process of target achievement. An extend relationship comprises two use cases one of which includes the other. The result of a use case can be either success or failure/error. Use Cases document the functionality of a planned or existing system using simple models. 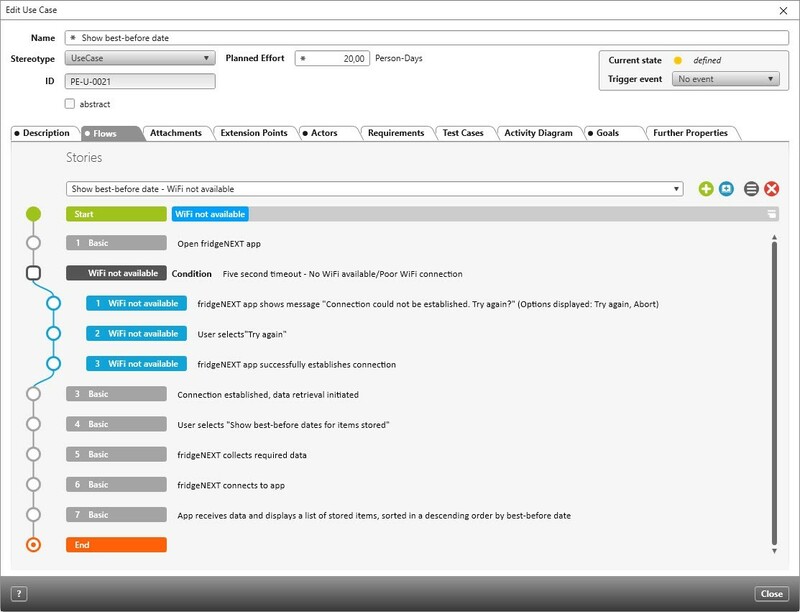 A use case describes the visible behavior of a system from the user’s point of view. A user may be a person or a neighboring system and is knows as an actor; he or she interacts with the system in order to achieve a specific goal. A single use case gets its name from the goal the actor wants to achieve and is a series of actions performed in a defined order. Use cases are popular because they are relatively easy to set up and because they substantially increase the interaction between the actors and systems. They are often used in product and software development. Products or software are developed to help people perform tasks more efficiently. A user should be able to use the product in order to reach his or her goals. Very often these goals are not defined clearly. This could lead to delays in the development process and to higher costs. This happens when requirements have not been correctly elicited. In these cases changes need to be implemented, development processes need to be changed and resources have to be distributed differently. The later requirements become apparent the more problematic and expensive the development process will become. A use case bundles all the possible scenarios that could occur when attempting to achieve a goal. In that sense a use case result can be a success, but it can also be a failure or abortion. How do I create use cases? Use case specifications contain information about how use cases interact with actors in an environment. The information is created with the help of templates, it is documented in text and should contain data points such as the: name (including identifier), description, participating actors, priority, criminality, responsibility, conditions, status, other use cases, standard and alternative procedures. Even conditions that are not subject to change, not even when an error has occurred, should be described. Sure, you could capture use cases with a pen and paper, but it’s much better to do so with software. Software offers you the big advantage of making several pieces of information related to use cases available immediately. The tabs in a form aid in the navigation. Users can orient themselves and find information easily. Below you can see the flow of steps as well as alternative steps. A standard procedure and an alternative flow (with poor Wi-Fi reception). Described step by step, optically and in an easy to understand way. Use cases give you an overview of a system’s behavior. A use case summarizes all the user-system interactions when a user wants to achieve a goal with the help of a system. A use case is more complex than a user story and as such it is generally easier to understand. Depending on the approach in the organization it will be used to refine requirements – if the requirements are too broad. Breaking them down into interaction steps aids in understanding. Alternatively organizations also utilize use cases as a source for requirements that arise from individual interaction steps. Use cases diagrams also offer a quick, easy-to-understand, graphical overview of the system’s functionality, their relationships with each other and the relationship between systems and their environment. A behavior diagram depicts the behavior of the system and helps you to specify the requirements of the system – a basic pre-requisite for every product development. Which other systems interact with the system? Who or what delivers information to the system? Who or what receives information from the system? What is the actor’s goal? Which “high level” actions do the actors need to carry out in order to achieve their goal? Which event will trigger the use case? Which actor will initiate the use case? How often (per minute/hour/day) is the use case carried out? Which conditions need to be fulfilled for the use case to come into effect? What state must the system be in for the use case to be triggered? Which conditions need to be fulfilled for the use case to be concluded? What state must the system be in for the use case to be concluded? How does the actor interact with the system? How does the system react (offer options, show information, execute a process)? What will the actor do next? Which alternative actions can the actor perform at every step? Which errors or disruptions can occur at every step? What should happen if the actor aborts the process? What should the planned system do? that are necessary to achieve user’s goals. Use cases are the best way to get clarity on what a system should be able to perform. By including actors, systems and system partitions you can get a good impression of the system behavior. Diagrams are particularly well suited to gaining an overview of complex systems. Depending on the tools implemented, use case diagrams offer much more, e.g. the possibility to illustrate dependencies and relationships between requirements, test cases, and system. Additionally so-called extent or include relationships between individual use cases can be illustrated, which will the complete function view on your system, forming the ideal foundation for your product development.